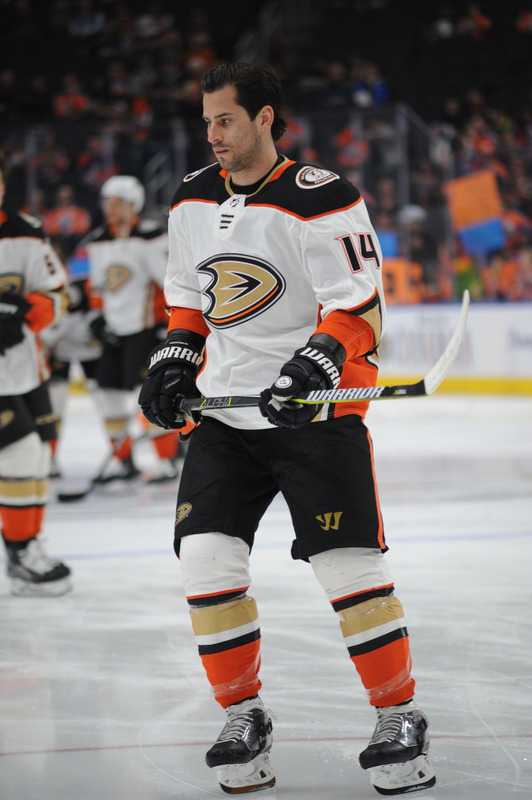 The Anaheim Ducks acquired Adam Henrique last season to give them some more versatility and scoring punch up front, and now it looks like he’ll be around for the long haul. Henrique has signed a five-year extension with the Ducks, that will keep him in Anaheim through the 2023-24 season. The new deal carries an average annual value of $5.825MM, but Henrique has one year remaining on his current contract which will pay him $5.5MM ($4MM cap hit) this season. With the extension, the New Jersey Devils will now receive Anaheim’s third-round pick in 2019. Henrique, 28, fit in incredibly well with the Ducks in the second half of the season, scoring 20 goals and 36 points in just 57 games. Add that to the 14 points he had for the Devils and Henrique posted the third 50-point campaign of his career while giving Anaheim a versatile player that can be moved all over the ice. Amazingly those 20 goals trailed only Rickard Rakell for the team lead (Ondrej Kase also scored 20 on the season) despite his relatively few games played, leading some to wonder what he can do in a full season with the team. Henrique has scored 30 goals in his career once, and will now be relied upon for that kind of production going forward. Earning nearly $6MM per season puts him behind only Ryan Getzlaf, Corey Perry and Ryan Kesler among the team’s forwards, and the deal falls in between contracts for players like Kyle Turris ($6MM for six years) and James Neal ($5.75MM for five years). Where Henrique will be used most often for the Ducks is unclear at this point. Though he does have experience on the wing in his career and was used there at times for the Ducks, the majority of Henrique’s time in the NHL has been spent at center. With the future for Kesler still up in the air given his recent injury troubles, there will likely be a hole in the middle for Anaheim this season that Henrique will be asked to fill. Rakell, also once considered a center, has found so much success on the wing the past few years that he likely won’t be asked to move back, leaving second line duties to the former Devils forward. Henrique was also given time on both the powerplay and penalty kill last season, which is likely to continue given his role and new contract. He’ll be asked to be a key member on a squad that is continually trying to contend for the Stanley Cup, and could even be tasked with going head-to-head with the opponent’s best forward line depending on whether or not Kesler is healthy enough to continue his career. With Antoine Vermette also out of the picture there are big defensive responsibilities up for grabs in Anaheim, something that Henrique has shown himself capable of in the past. Unfortunately he doesn’t come with the same faceoff skill, but few come close to matching Vermette in that category. It is somewhat curious that the Ducks would agree to such an expensive contract extension so quickly, given that they have huge question marks about their financial structure going forward. Brandon Montour, Nick Ritchie and Kase all remain unsigned for next season as restricted free agents, while John Gibson and Jakob Silfverberg will need expensive extensions before the start of 2019-20. Anaheim is already relatively tight to the salary cap this summer with just $9.5MM to spread out among their three RFAs, and could find themselves in a bind next year now that Henrique is taking up a big chunk. The outlook isn’t dire, but a $5.825MM cap hit for Henrique doesn’t give a lot of room for excess value and in fact brings some serious risk given he’ll turn 30 during the contract’s first season. Los Angeles Kings free agent signee Ilya Kovalchuk finally spoke to the media today after agreeing to sign a three-year, $18.75MM deal with the Kings on June 23. The 35-year-old superstar has now spent the past five years in the KHL, putting up some great numbers and has made it clear that he believes that despite his age, he has three or four good years left in him, according to Fox Sports’ Jon Rosen. The winger said one of his main reasons for choosing the Kings was because he wanted to play next to a high-end center like Anze Kopitar. Kovalchuk could be a perfect complement to Kopitar. The 35-year-old has been playing some of the best hockey of his career, posting 63 goals in his last two KHL seasons as well as winning MVP for Team Russia in the Olympics this past year. Kovalchuk also believes he is young for 35, but declined to say that he could put up a 30-goal season next season, according to Helene St. James of the Los Angeles Times. Kovalchuk last posted a 30-goal season in the NHL back in the 2011-12 season when he scored 37. Sticking with the Kings, Lisa Dillman of The Athletic (subscription required) does a Q&A with head coach John Stevens, who says that the Kings had no choice, but to place more responsibility on young players on their defense. The team has five veterans to hold down the core of the defense in Drew Doughty, Jake Muzzin, Alec Martinez, Dion Phaneuf and Derek Forbort. However, the team will have to rely on younger players, like Paul Ladue, Daniel Brickley and Kurtis MacDermid to fill out the rest of the roster. “There comes a point in time especially with the [salary] cap where you’ve got so many young guys. You have to make decisions,” Stevens said. Jason Brough of The Athletic (subscription required) writes that after assessing the offseason in which the team spent money on multiple bottom-six forwards, the Vancouver Canucks are putting all their success next season on the scoring ability of their young prospects. For one, the team lost three of the team’s top five scorers and now besides Bo Horvat and Brock Boeser, the team will need to get increased scoring output from other forwards, including Elias Pettersson, Sven Baertschi, Nikolay Goldobin, Brendan Leipsic and Jake Virtanen. If they can’t make up for that offense, it should be another long season. Eric Stephens of The Athletic (subscription required) looks at the Anaheim Ducks salary cap situation now and in one year from now to see if it will improve. Unfortunately the Ducks will not have much in terms of bad contracts that will come off the books in a year and the team will have to deal with other salary cap challenges instead. The team must deal with the cost of bringing back forwards Adam Henrique and Jakob Silfverberg, who will be unrestricted free agents as well as goaltender John Gibson, who will be a restricted free agent. The Ducks haven’t been overly active so far in free agency and that’s probably not going to change. In his latest 31 Thoughts podcast (audio link), Sportsnet’s Elliotte Friedman reports that Anaheim’s focus at this stage of the summer is to lock up a pair of key players to extensions. Goalie John Gibson and center Adam Henrique are both entering the final years of their respective contracts and the team clearly wants to lock both up long-term. Gibson will be a restricted free agent with arbitration rights next summer while Henrique will be an unrestricted free agent. Meanwhile, while the Ducks probably won’t be active in unrestricted free agency the rest of the summer, they still have some work to do with their own players. Defensemen Brandon Montour and Andy Welinski, as well as wingers Nick Ritchie and Ondrej Kase, are all in need of new contracts. The Flames are prioritizing signing newly-acquired forward Elias Lindholm to a long-term deal, GM Brad Treliving told Sportsnet 960’s Pat Steinberg (Twitter link). Treliving added that Lindholm’s camp is open to that type of contract as well. Calgary acquired Lindholm back at the draft after his contract talks with Carolina failed to yield a new deal. As things stand, he’s a candidate to fill their long-standing vacancy on the right wing of the top line next season. Coyotes center Laurent Dauphin suffered a setback in his rehab from a knee injury that has put his availability for the start of next season in question, reports Craig Morgan of Arizona Sports. Arizona reacquired the 23-year-old back in January as part of the Anthony Duclair trade with Chicago but he spent most of last season in the minors. However, given that he’s now waiver-eligible, he’d have likely got a long look at a roster spot with the big club in training camp, something that doesn’t appear to be an option now. The New Jersey Devils had a large group of draft picks last year when they possessed 11 picks, including the first-overall pick in which they netted center Nico Hischier. Now the team finds itself with just six draft picks this year after trading away their second and third round picks to add veteran players this season. The maneuvers worked as the team won 10 out of their last 15 games to clinch a playoff spot for the first time in six years. While the team does have the 17th pick in this year’s draft, NHL.com’s Mike Morreale writes that general manager Ray Shero is willing to consider trading down in this draft to recoup some of their lost draft picks. The team moved its third-round pick back in November when they traded centers Adam Henrique and Joseph Blandisi to Anaheim for defenseman Sami Vatenen, which helped solidify their defense. The team then moved its second-rounder at the trade deadline to pick up Michael Grabner, but the winger struggled when he arrived in New Jersey. After scoring 25 goals in 59 games with the New York Rangers, he potted just two in 23 games with the Devils. Morealle also asked Shero whether the team is interested in former star Ilya Kovalchuk, who is an unrestricted free agent and can sign with any team. “I’ve not reached out to Kovalchuk’s representatives and I’ve not heard from them, so there you go,” Shero said. Shero also told Morreale that the team chose not to sign 2016 fourth-rounder Evan Cormier to a contract (thereby allowing him to re-enter the draft this year) because he’s happy with the pipeline of goaltenders the franchise already has in MacKenzie Blackwood, Ken Appleby, Cam Johnson and Gilles Senn. No one could have expected that the New Jersey Devils would improve by 16 wins from last season to this season, transforming from a bottom feeder to a playoff team. The team added impact rookies Nico Hischier and Will Butcher and traded for defenseman Sami Vatanen, but also lost Adam Henrique in that deal and watched 2016-17 top-six forwards Mike Cammalleri and P.A. Parenteau depart. Yet, the team took a major leap forward with only a marginal improvement to their roster. Hoping for a repeat in that trend, NJ.com’s Chris Ryan reports that GM Ray Shero has been given the “green light” by the Devils to spend in free agency this summer. New Jersey enters the 2018 off-season with substantial cap space. A bottom-five spender this season, the team is likely to lose Patrick Maroon, Michael Grabner, Drew Stafford, and Jimmy Hayes to free agency, which will open up even more room. They will also finally be rid of Ryane Clowe’s cap hit. Even if the team was to hang on to defenseman John Moore, goaltender Eddie Lack, or forward Brian Gibbons, they would still have more than enough space to make a significant splash this summer. Ryan addresses several players who Devils fans are intrigued by in his mailbag. He begins by throwing water on the idea that New Jersey will be in hot pursuit of John Tavares if he hits the open market. Seeing as Tavares will command a seven-year deal that could approach nine figures, Ryan rules the Devils out as a destination. New Jersey has its star center of the future in Hischier and must pay he and Hart finalist Taylor Hall in the next few years. However, Ryan does not shy away from any other recommended targets. Among those other players the Devils could pursue are defenseman John Carlson, who would be the biggest name on the market if Tavares re-signs with the Islanders, fellow blue liners Mike Green and Calvin de Haan, and big winger James van Riemsdyk. Ryan rules out a reunion with Ilya Kovalchuk, but New Jersey could also be a destination for other stars of yesteryear like Joe Thornton or Rick Nash. Evander Kane, Paul Stastny, David Perron and James Neal are other top names who could wind up in Newark. Ryan does add that the Devils may be content to sign just one of the big-name players on this summer’s free agent market. Given the luck he had making a blockbuster trade this year, Shero could surely explore the trade market instead of exclusively signing free agents. He may also want to give time to forward prospects like Michael McLeod and Joey Anderson, after Hischier, Jesper Bratt, and Blake Coleman found success this year. It will be a busy off-season one way or another for New Jersey and will continue to be a fun process of building a contender for team members and fans alike. Despite suffering a sweep at the hands of the San Jose Sharks, Anaheim Ducks executive vice president and general manager Bob Murray gave a vote of confidence to coach Randy Carlyle today, according to Mike Coppinger of the Los Angeles Times. However, Murray also said he is looking for changes in the team’s style of play. The team made the playoffs despite being plagued by injuries. Carlyle, who has coached the team for the past two years after serving previously as the Ducks’ coach for seven years from 2005-2012, had no players who played the full 82-game season. First liners Ryan Kesler only played 44 games, while Ryan Getzlaf only played 54 games. Even Corey Perry missed 11 games due to injury. However, with an aging offense, the team needs to increase its speed if it wants to compete in the same division as the Vegas Golden Knights or the San Jose Sharks. Kesler admitted he struggled trying to get his way back this season after undergoing hip surgery last offseason. He was forced to re-learn how to skate. “Learning how to basically skate again, and coming back behind the eight ball when everybody is in mid-season form and you’re in training camp mode, is hard. It’s not an excuse. I’m way better off now than I was before the surgery.” Eric Stephens of the Orange County Register adds that Kesler lost 20 pounds in the last month to increase his speed. He intends to play at his new weight next season in hopes of lengthening his career. Kesler, originally listed at 202 pounds, will be needed to return to full form next season if they want to continue with their playoff success. He is locked up for another three years at $8.625MM with a no movement clause. Center Adam Henrique, who the team acquired back in November, has said he is interested in signing an extension with the team this offseason. The 28-year-old scored 20 goals in 57 games with the Ducks and 24 total goals. He has one more year at $4MM and is eligible for an extension on July 1. Veteran defenseman Kevin Bieksa didn’t leave the team on a positive note, suggesting that despite having a ruptured tendon in his finger, it was “very disappointing” that he didn’t get more playing time in the team’s playoff series. The 36-year-old played in just one game against the Sharks. “It didn’t turn out to be a good-looking decision,” said Bieksa. He will be an unrestricted free agent this offseason. Stephens added veteran winger Patrick Eaves, who had surgery on his shoulder in March, will be ready this fall with an October timeline. Eaves, who scored 32 goals between Anaheim and Dallas last year, played in just two games this season. Antoine Vermette says he believes he has more hockey left in him. The 35-year-old will be an unrestricted free agent this offseason. He said he will discuss his situation with his family about whether he will return next season. “I’ve never been in this situation. I’ll take my time to kind of see what we want to do here,” said Vermette about his uncertain offseason. The Ducks also announced that Hampus Lindholm, Rickard Rakell and Korbinian Holzer will each play for their respective countries in the 2018 IIHF World Championships. Tyson Barrie will be out four to six weeks with a hand injury according to Colorado Avalanche head coach Jared Bednar, a huge loss for the team as they look to stay competitive in the Western Conference. Barrie was off to a great offensive start this year, recording 27 points through his first 34 games while once again logging more than 21 minutes. In his absence, Bednar explained that Erik Johnson and Samuel Girard will take most of the powerplay time, though it will be tough to fill Barrie’s shoes with the man advantage. The 26-year old already had 10 powerplay assists on the season, the third time already in his career he’s hit double digits. Ryan Kesler will be back on the ice for the Anaheim Ducks tonight, his first game of the season after undergoing hip surgery in the summer. Kesler is a huge part of the Ducks’ two-way game when healthy and playing his best, and should give the team a boost up front. With Ryan Getzlaf back already, and added depth in Adam Henrique, the Ducks are a team to watch in the second half. Zach Parise is headed to the minor leagues, if just for a day. The Minnesota Wild forward will play in an AHL contest Thursday as part of a conditioning stint which Michael Russo of The Athletic reports won’t be for very long. Parise is another veteran forward who hasn’t played at all this season, and would be a welcome sight in the Minnesota locker room.